Coping with chronic pain is not an easy way of life. The constant and intense pain makes it nearly impossible to live a rich and fulfilling life. Thankfully, not all hope is lost and you don’t have to continue suffering with chronic pain. The first step is knowing the symptoms, causes and pain relief options available for chronic neck and shoulder pain. Once you are armed with this information, you can make an informed decision on what is your next best course of action. Pain is the most common symptom and is often described as crampy, stabbing, burning, shock-like or dull. 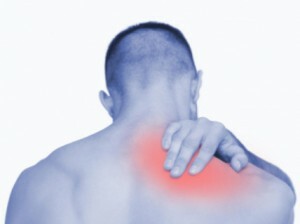 The pain can lead to stiffness in the shoulder or neck, as well as a decrease in range of motion. Chronic pain in the neck and shoulder can also result in frequent headaches. Along with pain, you may experience numbness and/or weakness. Numbness typically occurs if the nerves are cut, bruised or pinched, which may inhibit your sensory receptors or cause a tingling, burning or fall asleep sensation. Color changes and coolness are two other symptoms associated with chronic neck and shoulder pain. If you notice a white or blue tinge to the skin on your shoulder or arm, it could be a sign that your veins or arteries are injured. A redness to the skin is a sign of inflammation or infection. Coolness could indicate that the proper amount of blood isn’t reaching the arm or that the veins or arteries are blocked or injured. Some sufferers of chronic neck and shoulder pain will also experience swelling or deformity. The swelling can occur over the entire arm or it could be localized to one specific spot. A deformity is generally a sign of a dislocation or fracture. There are various causes for chronic pain in the neck and shoulder. Trauma, muscle strain, joint or bone abnormalities, poor posture, tumors and degenerative diseases can all cause neck pain. Since the shoulder is a socket and ball joint that has a large movement range, it is more susceptible to injury, according to the Cleveland Clinic. Tendonitis from overuse, dislocation, overexertion strains, joint instability, bone fractures and pinched nerves can all cause chronic shoulder pain. On a quest to find relief from the pain, suffers will often try a wide array of pain relieving treatment. Unfortunately, most of these so-called treatments provide little to no relief and often come with some serious side effects such as addiction. Because of this, chronic pain sufferers will either deal with the debilitating pain as best as they can or continue to take the dangerous pain relieving drugs prescribed by their doctor. This is when natural pain relievers come in handy. Natural pain relief treatment doesn’t contain the dangerous ingredients or addictive qualities often found in other pain relieving products and are available over-the-counter, which means a doctor’s prescriptions isn’t required. Hemp is one such herbal treatment. This topical treatment has shown to have pain relieving and anti-inflammatory properties. Unfortunately, hemp, and any product made from it, has been shrouded in controversy because of myths, mistaken assumptions and lies. For years, the misconception that hemp oil could get you high and was the same thing as marijuana kept pain relief cream that contained hemp out of the hands of those who desperately needed it. While hemp oil comes from the same type of plant as marijuana (cannabis), hemp cannot get you high or give you a stoned feeling. Explore the many modern uses of the hemp plant. Other natural treatment options include ointments and creams that contain Capsaicin, which is a natural byproduct of peppers, exercise, acupuncture and physical therapy. Always speak to your primary care physician before beginning any pain relieving treatment. While there is little chance you will have a bad reaction to herbal treatments, consulting with your doctor beforehand will help ensure the organic pain reliever you want to try won’t interfere with any medications you are currently taking or react badly to any conditions you may have.